If you haven't read Part 1 and Part 2 of the Case of the Slowly Sinking Ship, then you might want to check those installments out first - click here and here to have a read. Could this be the cause of the mysterious leak on Tickety Boo - an attack by the aliens from outer space? Nancy Drew was curled up on the couch next to the fireplace in the spacious living room at the Drew's house in River Heights. 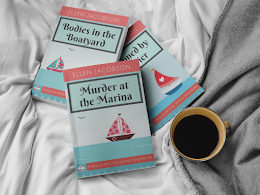 She was staring off into space, tapping her pencil on her notebook and trying to figure out what could have caused the leak on her friend Bess' boat. Absorbed in her thoughts of seacocks, thru-hulls and fresh water systems, she didn't hear the Drew's housekeeper, Hannah Greun, come into the living room. "Nancy, you have a phone call. Bess is on the line and she sounds distraught," said Hannah. 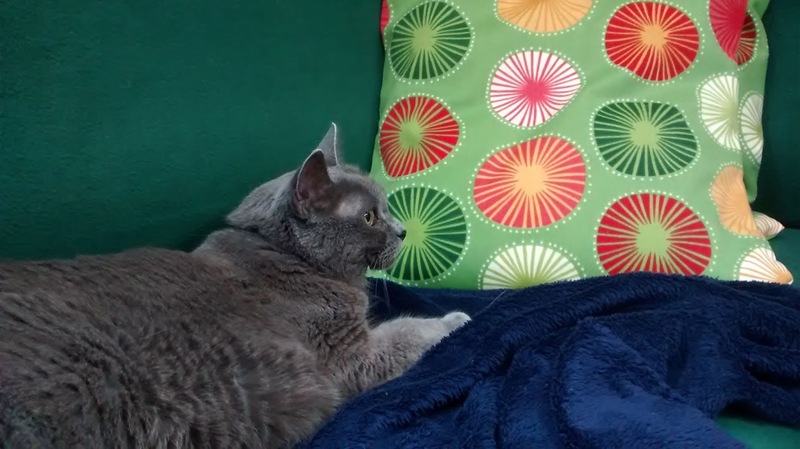 You better see what she wants. After you've spoke with her, come into the kitchen and try some of this apple cobbler I just took out of the oven." "Thanks Hannah. I'll take the call in the den and then I'll be right in for some of your world famous cobbler," said Nancy. As she got up from the couch, she asked, "Do we have any vanilla ice cream to go with that cobbler?" Hannah smiled fondly at Nancy. "Of course dear. I wouldn't dream of serving cobbler without ice cream." "Thanks, Hannah. Father and I are so lucky to have you taking care of us." Nancy turned, went into the den and picked up the phone. "Bess, what's wrong? Hannah said you sounded worried." "Oh, Nancy. You won't believe what's happened now," Bess exclaimed. "I've got another leak on my boat! It's just my luck. You know that Dave is back from college this weekend and he was going to take me out on a hayride tonight. But, how can I go anywhere knowing my boat might sink at any minute?!" Nancy frowned and said, "That's strange. I wonder what could have caused another leak on your boat. Gosh, Bess. This is the most perplexing mystery. Don't worry, I'll be right over. I'll even bring you some of Hannah's apple cobbler. That should help take your mind off of this leak." "Oh, thank you Nancy. You know how much I love apple cobbler! I should be on a diet, but I really could use something sweet just now. I'll see you soon. That is, if my boat hasn't sunk into the water by the time you get here." I know some folks might be thinking that Nancy Drew has actually solved the Case of the Slowly Sinking Ship and that I'm just stringing everyone along with these installments of the Nancy Drew Investigates series. Nothing could be further from the truth. I still don't have a clue what happened on that infamous day when the bilge pump started going off. And, to top it off, I found a new leak on Thanksgiving. Yes, a new leak. Go figure. When it rains, it pours. Seems like an apt metaphor for a leaking boat. So, what's happened since I last left you with Part 2? Matt and Jessica came back over on Tuesday to see how things were going. We talked about the fact that when I filled the fresh water tanks on Sunday, the bilge had filled up with water, leveled off and then stopped. We decided that I should play around with isolating out two tanks and running experiments filling them up alternately and turning on the water pump to see what would happen. Only one teeny tiny problem with this plan. I'm a weakling and I can't turn the plastic handles on the balance tube which connects both tanks to each other and the various hoses which lead to the sinks, shower and hot water heater. Scott turned them when he was here and said it was a piece of cake. I couldn't make either one budge. By this time, I was getting tired of the whole Case of the Slowly Sinking Ship. It was starting to feel more like the Case of the Annoying Boat Up to No Good and Trying to See What Will Send Ellen over the Edge and into a Chocolate Coma. Unlike Nancy Drew, who would doggedly persist in trying to solve the mystery, I decided to ignore the whole situation for a couple of days. Who needs a fresh water system anyways? I just trundled off and filled up some water jugs each day for washing up, drinking and the like. On Thanksgiving morning, I decided it was about time that I opened the saltwater intake seacock so that I could flush our toilet. It hadn't been the cause of the mysterious leak, so there wasn't any reason to leave it turned off. I ate a couple of Oreos (amazingly there were still some left from the ones Michele and Bruce had brought me earlier in the week), got myself together, said a few more naughty words and checked out the seacock. From what I could tell, the leak wasn't coming from any of the hoses. The hoses were complete dry and the leak seemed to be coming from the fitting itself. It would have been so much simpler if it had been one of the hoses. That would be easy to fix and could be done while the boat was in the water. Instead, I started working through the worst case scenarios of having to have the boat hauled out so that it could be fixed in the work yard. Talk about depressing - more Oreos were required. We had had this seacock and thru-hull (along with two others) put in by the guys in the work yard back in April/May, so my next step was to have Graham, the service manager, come out and have a look since they guarantee their work. Of course, it was Thanksgiving, so no one was around. I headed off to my friend's for Thanksgiving dinner and consoled myself with turkey and all the trimmings, along with a very large slice of pumpkin cheesecake. Pumpkin pie - yuck, pumpkin cheesecake - yum. I came back to the boat and it was still floating. This is what my life has become. Anytime, I go someplace, I wonder if my floating home will be above water when I come back. Graham came by to have a look on Friday. He couldn't see very well into the compartment and he and his guys are slammed with work right now, so we made arrangements for him to come back the next day with his handy mirror and tools. On Saturday, Graham came back and poked around. He agreed with me that the leak wasn't coming from the hose. On one hand, it was nice to know that I wasn't off my rocker when I had ruled out the hose. On the other hand, having a leak from the thru-hull or seacock is never a good thing. Graham took the hose off and had a look at the fitting. Turns out everything was fine after all - the hose was the culprit. I tell you, these mysteries are enough to do my head in. False leads everywhere. Just when you think you've got it figured out, your case falls apart. Sneaky hose leak - winding it's way around some hidden path to give the illusion that it was coming from the fitting. Although he didn't have to, Graham replaced the hose for me. He talked me through the process, showed me what he was doing, explained the different types of hoses, how to put the clamps on etc., which will come in handy once I track down the leak or leaks in our fresh water system and may have to replace other hoses and clamps. The new hose did the trick. No more leaking from that particular spot on our boat. But, the Case of the Slowly Sinking Ship continues. Stay tuned for Part 4 of Nancy Drew Investigates. Hopefully, Part 4 is the conclusion of this sorry saga. At this point, I don't know when I'll have an update as I'm just not going to deal with this investigation until next week. Georgie the Sailing Cat is staying with me this week while her humans are away and she likes to get into everything, as cats do. So, it seems easier to wait until she's gone to pick the investigation back up. 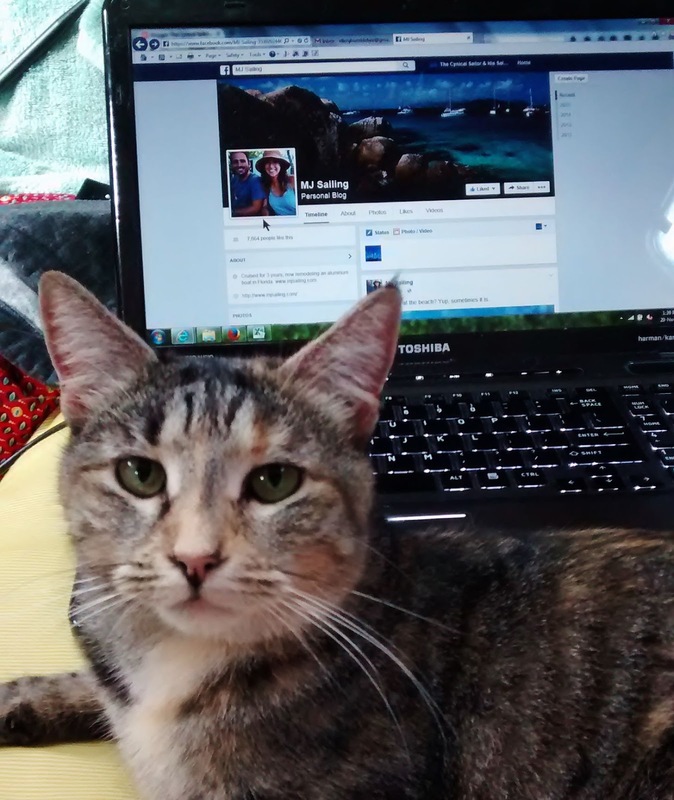 Besides, unlike Nancy Drew, I'm a complete slacker and need a break from all of this detective work, so Georgie seems like as good excuse as any to put the whole thing on hold. She'd much prefer to just hang out and snack on cheese this week and so would I. Wouldn't you rather snuggle up with this adorable cat then try to track down a leak(s)? If you haven't read Part 1 of the Case of the Slowly Sinking Ship, then you might want to check it out first - click here to have a read. 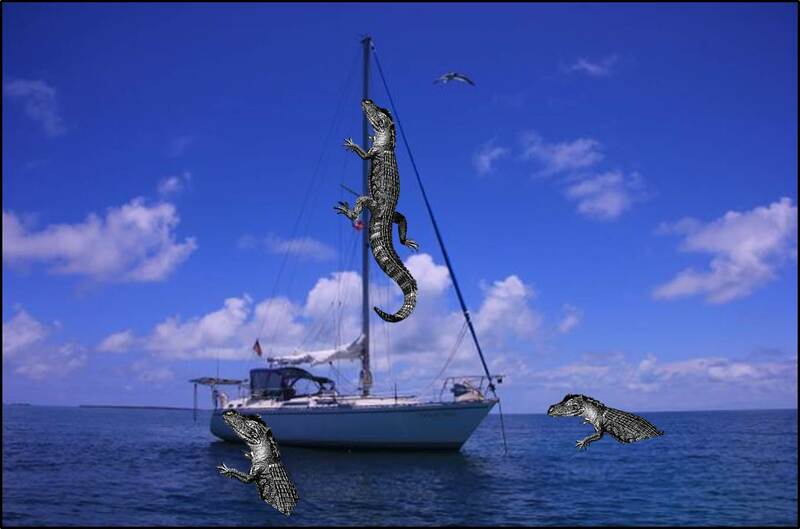 Could this be the cause of the mysterious leak on Tickety Boo - an attack by the marina alligators? "Bess, I thought you were on a diet. Are you sure you should be eating so many Oreo cookies?" said Nancy Drew. Bess wiped chocolate crumbs off of her face, turned to her friend and said, "I know, you're right. If I gain one more pound, I won't be able to fit into that new dress I bought and then I won't have anything to wear to the sock hop at the yacht club tonight. But, I just can't help myself! This Case of the Slowly Sinking Ship is so frustrating that the only thing that makes me feel better is chocolate." Nancy got out her notebook and pencil and said, "Now, Bess, we just need to look at things logically. Let's go through our list of suspects and try to see who had motive, means and opportunity to commit this dastardly crime." Just as Nancy opened up her notebook, her boyfriend, Ned Nickerson, walked into the room and said, "Gee, Bess, don't you ever clean out that lazarette of yours? It really stinks down there." Bess blushed and said, "I'm sorry, Ned. I completely forgot to take care of that. I've just been so busy with other things like shopping for my new dress and checking out the new ice cream parlor that opened up in town. They serve the most divine root beer floats." Bess stared off into space, daydreaming of ice cream sundaes and banana splits. Nancy shook her head at Bess and then turned to Ned. "You're just in time. We were going to go through the list of suspects in the Case of the Slowly Sinking Ship. Have you found any clues that can help us out?" "Well, you can cross everyone off the list except the fresh water system, " Ned said. "It looks like the leak might be coming from there." Bess gasped and said, "Gosh, do you think one of those alligators swimming around in the marina got on my boat and chewed a hole though one of the water hoses?" Ned looked at Bess in disbelief. "An alligator? You really think an alligator caused this? Sometimes, I just don't know about that imagination of yours." Bess stared helplessly at Nancy and Ned and shrugged her shoulders. "But, what else could it be? And, what if they come after me next!" Nancy smiled at Bess and said, "There, there Bess. It isn't alligators that did this. You'll just need to buckle down and work through this systematically. Here, have another Oreo cookie. That will make you feel better." Of course, this isn't exactly how things played out over the past few days. But the Nancy Drew version is a lot more interesting and entertaining then reality. Reality is full of hard to reach places on your boat, stinky lazarettes and water that seems to come from nowhere. In Nancy Drew's world, everyone is always dressed smartly and Nancy solves the mystery without ever breaking a sweat. Because of course, she's Nancy Drew - she doesn't sweat, she doesn't even perspire. She might occasionally have a healthy glow from a tennis match, but she never sweats. In our last installment of Nancy Drew Investigates, the mysterious leak had stopped the minute that Graham, the service manager in the boat yard, and my pals, Matt and Jessica, popped by to help with the investigation. Isn't that always the way? The minute someone who knows what they're doing comes by to help you, the problem stops. They look at you funny, like you're some sort of boat hypochondriac, imagining mystery problems with your boat just to get attention. I somehow convinced them that I hadn't hallucinated the whole thing and then headed off to the party at the marina with Matt and Jessica. I had a few beers and something to eat and then settled in for the night on one of the settees in the saloon so that I could hear if the bilge pump went back on during the middle of the night. I'm sure it won't surprise you to know that I didn't sleep very well. Dreams of sinking ships and alligators swimming around my boat waiting to pounce on me filled my head during the night. I woke up often and peered into the bilge anxiously. Nothing but a little bit of a water. If I hadn't known better, I might have thought I dreamed up everything that happened on Saturday. But, I didn't. Trust me on this. I know I have an overactive imagination, but it usually leans towards things like alien abduction, not my boat leaking and slowly sinking to the bottom. 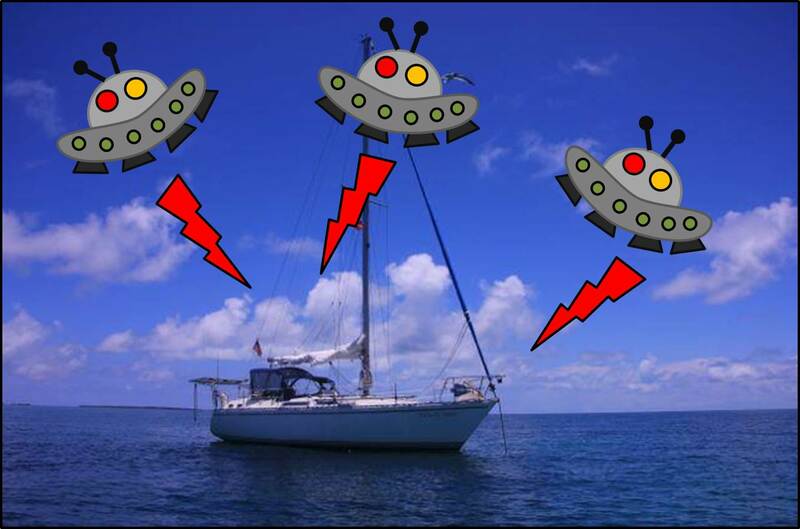 I'd rather be transported up to a spacecraft and experimented on then deal with these kinds of problems on my boat. Matt and Jessica popped round later on Sunday. I had cleared out the lazarette so that we could have a good look in there, which is a pain in the you know what. Our lazarette is big enough to store dead bodies in it, so you can only imagine how much crap we have in it. Our 40 pound Rocna anchor, tons of lines, a huge box of chemicals, cleaning products, solvents and the like, diesel jerry cans, buckets, stuff that the previous owners left which I've never been able to identify and other bits and bobs. Once you get all of that out, you're left with lots of hoses that lead to mysterious places, a diesel tank, a hot water tank and our holding tank, which I affectionately call our PPB (or pee and poo box). Have I mentioned what a sweetheart Matt is? Bless his cotton socks (which is a strange saying by the way, why would you want your socks blessed? ), Matt jumped into the lazarette and checked all of the seacocks out. I hadn't had our PPB emptied in a while so it stunk like the dickens down there (another strange saying) and it might have been leaking a little bit too. Yeah, Matt went down into the deep, dark pit of utter grossness to check things out. Jessica snagged herself a good one. He's a keeper. One of our seacocks was looking a wee bit suspicious, but we couldn't tell if it was leaking or if the water around it was just due to the torrential downpour on Saturday. Matt told me to keep an eye on it. Next up, Matt poked around in the engine room again and looked at the stern tube. It all looked okay - not the source of the leak. I showed him where I thought the path was that the water was taking - from the lazarette into the aft cabin, through the engine room and into the bilge. Everything was pointing towards a problem with the freshwater system, so he told me to fill up the tanks again and see what happened. So, I did. Water poured into the bilge, but then it leveled off just below the line where the bilge pumps start kicking in. This was both odd and exciting. Seriously, did I just say this was exciting? This will give you a sense of how warped my worldview has become. I used to think getting a pair of black boots with an adorable wedge heel on sale or finding a new Ethiopian restaurant was exciting. Now, I think finding water in my bilge is exciting. 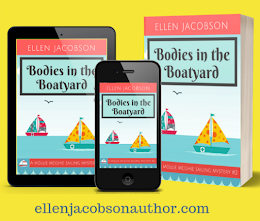 I skipped over to Matt and Jessica's boat with a huge smile on my face and screamed out, "I've got water in my bilge!" Matt gave me a huge high five. We were all excited - we had found the source of the leak. Never mind that we didn't recreate the actual problem on Saturday with a continuous leak and the bilge pump going off. Yes, that was odd, but we had water in the bilge again. Things were looking up. I spent the day poking around trying to trace all of the water hoses and figure out where the leak could be coming from. I drained the tanks again before bed, took all the water out of the bilge and slept somewhat better that night. At some point, I posted something on Facebook about how frustrating things were getting and whined about not having any chocolate. Michele and Bruce from Sailing Wind Spirit brought me over Oreos and a giant Hershey bar to ease my pain. Aren't cruisers wonderful? They're always there to help you out in times of need. So, that's where we'll leave the story for now - a dry bilge and plenty of chocolate. But, stay tuned for Part 3 of the Nancy Drew Investigates series. Spoiler alert - things are never easy. Things get confusing again. One of our original suspects, who we had crossed off the list, left some new incriminating evidence. Was it a red herring or the cause of the leak? 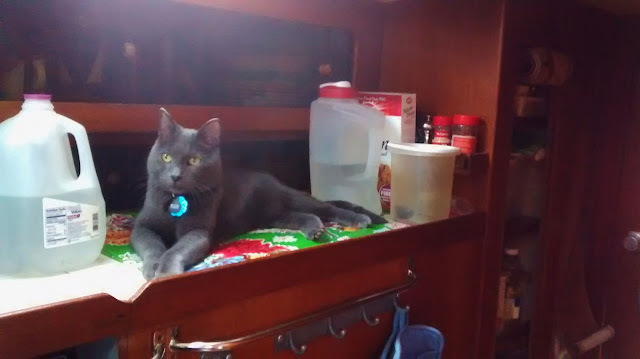 For someone who doesn't actually own a cat, I've become something of a Crazy Cat Lady here at Indiantown Marina. I kittysit Georgie the Sailing Cat from time to time when her humans are out of town and now Charlie and Jane's cats are spending the day with me while they get their boat cleaned up and ready to move onto. 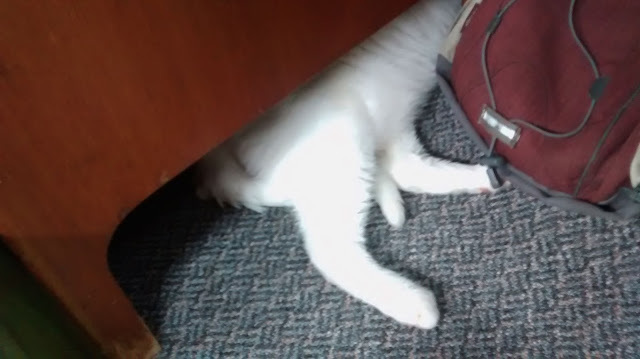 In the meantime, I've had to open up a new case file - the Case of the Disappearing Cat. Charlie and Jane have three cats - Evy, Smokey Joe and Sugar. Evy is a sweet little kitty who seems to be the boss of her two brothers. She immediately picked out the prime spot right next to the new pillows I made and settled in for a nap. Smokey Joe isn't supposed to be up on the counters, but our babysitter always let us break a few rules, like stay up past our bedtime, so I figured Smokey Joe should have some fun too. This is about all you're going to see of Sugar. Sugar likes to hide. He thinks if he can't see you, then you can't see him. Someone should tell him his feet are sticking out. Sugar stayed under the chart table for quite a while. Then he came out for some food. I thought heard him go back under the chart table, but couldn't see any feet. He's a huge cat and hard to miss. I looked under the table - no Sugar. I looked everywhere - no Sugar. It's not like this is a huge boat with lots of places to hide. In fact, I had the cats confined to just one cabin so I could keep tabs on them. Still no Sugar. I was trying to figure out how to explain to Charlie and Jane that one of their cats had disappeared. I wasn't sure that they were going to go for the alien abduction explanation, but it was looking to be the only logical solution to this puzzle. Fortunately, Sugar has now reappeared. All I can figure is that he was either beamed back down from the spaceship or he managed to find a secret hiding space somewhere between the hull and the chart table. If it was the latter, the good news is that he wasn't wet, so we can rule that area out as the origin of the leak on our boat. Anyway, everyone here is napping, so I better join them. Indiantown Marina is having a week of Thanksgiving festivities and I just got back from the dinghy races. Now, I have to rest up for the grape stomping competition tonight. I figure even Nancy Drew took a break from her investigations from time to time, so I should do the same. See you back here on Friday with the latest from the Case of the Slowly Sinking Ship. "Bess, where are you?" said Nancy Drew as she came alongside her friend Bess' boat, Tickety Boo. "The party's started. We came to see why you haven't shown up." Nancy glanced worriedly at her boyfriend, Ned Nickerson, "Do you think she's all right?" Ned smiled and said, "I'm sure she's fine. You know Bess. She's probably down below reading a mystery novel and lost track of time." He knocked on the hull of Bess's boat and shouted out, "Bess, are you there?" Bess poked her head up through the companianway, wiping chocolate off of her face with one hand and engine grease off of her arm with the other. "Gee willickers, am I ever glad to see the two of you! My bilge is full of water and the bilge pump has been going off every two minutes. I don't know what to do! I called Dave hoping he could come over, but I forgot that's he's out of town. My cousin George came by and had a look and was a big help, but the bilge pump still keeps going off. I'm at my wit's end!" She sighed and ran her fingers through her hair, which only made her frizzy curls even more unruly and streaked in chocolate and engine grease. "Thank goodness, I remembered that I still had some of that chocolate cake leftover from my birthday. I know I'm supposed to be on a diet, but it just looked so delicious and this is all so stressful that I just couldn't help myself." Nancy said, "Oh, Bess, don't worry. It will be okay. Don't forget, Ned is a whiz when it comes to figuring out problems with boats. Besides, it will be a fun mystery for us to solve! We can look for clues like we did in when we solved the Secret of the Old Clock." Nancy and Ned climbed on board. While Ned went down below to have a look at the engine room and bilge, Nancy gave Bess a hug and said, "First, let's see if we can do something with that hair of yours." Okay, so that's not exactly how the drama aboard Tickety Boo unfolded this weekend, but the version with Nancy Drew is a lot more fun than what really happened. Does anyone else remember the Nancy Drew mysteries? Do girls even read them anymore? I had the complete set and loved reading about Nancy's adventures with her best friends Bess and George and her boyfriend Ned. Nancy is much more calm and resourceful when it comes to mysteries than I can over hope to be. Bess was the pleasantly plump one with a weakness for sugary treats who always gets a bit nervous when she's in a dangerous situation. My kind of girl. She had a steady beau named Dave. I've got a steady beau named Scott. The similarities are eerie. So, here's how it really went down. Around 11:00 AM on Saturday, I heard the bilge pump go off. For those of you who don't know much about boats (like me), whenever the water level gets too high in the bottom of your boat (the bilge), then the bilge pump pumps the water out. Water inside your boat is never a good thing. Outside your boat is fine. Inside not fine. This is what our bilge looks like. Imagine it with more water in it, the bilge pump going off and Bess panicking. Some folks have wet bilges, but ours is usually dry, except when it rains. We hadn't had much rain lately, so imagine my surprise when I opened up the bilge and saw quite a bit of water down there. Enough that the bilge pump was automatically kicking on and off. I yelled out for Scott, "Scott get over here. We've got water in our bilge." And then I remembered that he's in Scotland and I'm here alone in Florida on a boat that might sink. So I called him instead and we did some troubleshooting over the phone. There were so many possibilities as to what could be wrong. I channeled my inner Nancy and, along with my steady beau Scott, put together a list of suspects. We've got these things called thru-hulls. They're basically holes in our boat and they come with little doors called seacocks which close them up. Seems silly, doesn't it. Holes in your boat. Holes let water in. 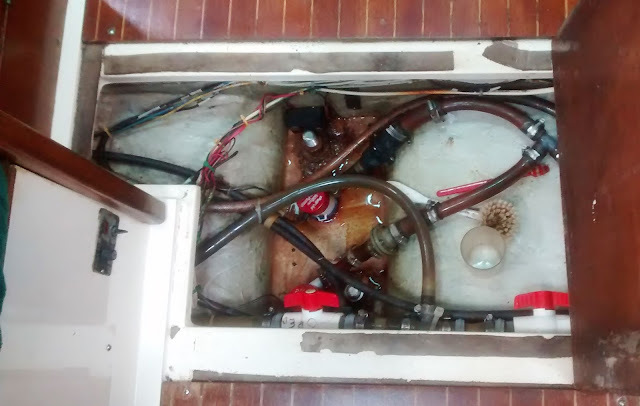 I think we already discussed this - water inside your boat is never a good thing. You can have holes above the water line and below the water line. It's the holes below the water line that are of concern in this particular little mystery. I have to say, I'm leaning towards thinking suspect #2 is the guilty party. If only because it would mean that the water inside our boat isn't coming from outside our boat. If the fresh water system is to blame it could be because one of our water tanks is leaking, our hot water tank is leaking, there's a problem with the water pump or one of the gazillion hoses connecting this system with the various faucets, drains etc. are leaking or burst. It's kind of like knowing that someone in a particular gang committed the crime, but you just can't figure out which one of them did it. If our boat was in salt water, it would be easy to rule this in or out by taste. Salty water would mean it's coming from outside. Fresh water from inside. Unfortunately, we're docked in fresh water at Indiantown Marina. I guess that's good in a way, no one has to taste the icky water in the bilge. Suspect #3 is the hardest one for me to get my head around. All I know is that there is a tube which the propeller shaft goes through which connects somehow to the engine transmission through the stuffing box and the whole thing makes your boat move, as if by magic. The thing with the propeller shaft is that it goes out through yet another hole in our boat. So, it could be that something related to this contraption is leaking. Suspect #4 is where the rudder comes through the boat and connects to the steering system. Yes, we have yet another hole in our boat. This one is for an impeller which rotates around in the water below our boat and tells us how fast we're going. Of course, we can't discount the possibility that one of the alligators hanging out at the marina chewed a hole in our boat. If could even be one of the turtles. Now that we had our list of suspects, it was time to start questioning them. I started off with the easiest one - the knot meter impeller. I opened up the cubby hole under the settee, had a look inside and it was completely dry. Suspect #4 was crossed off of the list. Then I moved onto closing the easiest to access below-the-waterline seacock - the saltwater intake for our toilet. The area around it was dry and closing it didn't make any difference to the water flowing into the bilge. I checked the rudder stuffing box and everything was dry up there. At this point, I was starting to get cranky, so I popped over to Burger King and got a Junior Whopper meal. It's what Bess would have done. When I got back, there was no change. Water still coming into the bilge and the bilge pump still going off every two minutes. As I ate my Burger King, a torrential downpour started. This was bad news on so many levels. It's so much harder to figure out where a leak is coming from when it's raining. But, on the bright side, it helped clean off the little presents all the tree frogs leave on our boat at night. Those guys need their own PPB. Feeling fortified by my greasy meal and iced tea, I then drained the water tanks to see if it might be Suspect #2 that was causing the problem. There wasn't any change, but I knew there would still be residual water in the tanks that could be leaking out. And of course it was still pouring down so who knew if the water coming into the bilge was due to the rain or something else at this point. I was really starting to wish I had gotten a hot fudge sundae along with my meal. The water kept coming and coming and coming for a few hours. Never enough that it overwhelmed the bilge pump, but enough that I was starting to get a little worked up about the boat sinking. Earlier, I had looked in the engine room and seen a puddle of water underneath the stuffing box. I thought it was just pooling there and not going anywhere else as the area underneath the engine was dry. But I couldn't see very well in there with my flashlight. Bruce from Sailing Wind Spirit came over with his super sonic spotlight and had a look for me. He saw that there was an overflow hole bypassing the engine and flowing into the bilge. By this point, the water was steadily flowing through. But was it the rain or the original leak? Clueless, I went to see if the Graham, the boat yard service manager, was around to come have a look. I tracked him down and he said he would be over in a few minutes. I went back to the boat, stared at my bilge helplessly and cursed myself for not having a giant chocolate bar on board. Then, Matt and Jessica from MJ Sailing popped by to see why I wasn't at the party at the marina. After all, there was free food and beer - something I would never normally pass up. I popped my head up out of the companianway and said something about my boat sinking. They came on board and Matt started checking things out. Guess what happened the minute they showed up? Yes, that's right. No more water and no more bilge pump going off. Graham came by not long after and had a look around. The general consensus was that it seemed unlikely it was related to the stern tube or stuffing box as our boat hasn't left the dock in months. It was dark, I was hungry and thirsty and we still didn't have a clue what was going on. But the leak had stopped. So, we headed over to the party. Matt was an absolute sweetheart and talked to Scott on the phone to explain the situation and talk through where to go from here. While he did that, I drank a beer and tried to forget all about Tickety Boo for a while. I went back and checked the boat after a while - no leak and a quiet bilge pump. I went back to the party and had another beer and some barbeque. Free is my favorite kind of drink and food. And they had corn bread. I love corn bread. Not as much as chocolate, but it's pretty high up on my list of food items I adore. The rain started again, my hair kept getting frizzier and I called it a night. I slept on the settee in the saloon so I could hear if the bilge alarm went off during the night and dreamed about having our boat struck by icebergs and shipping containers and sinking into the alligator infested sea. Not the most restful night I've ever had. Stay tuned for Part 2 of the Case of the Slowly Sinking Ship. Spoiler alert - I still don't know what the heck is going on and I need more chocolate. Check out these other installments of the Nancy Drew Investigates series - Part 2 and Part 3. What Makes A Blog Or Facebook Post Popular?